Adams Autoworx provides Castro Valley Geo service and repair that’s second to none. We can service and repair any Geo currently on the road. We perform regular maintenance, oil service, as well as complex diagnostics including electrical system diagnostics, as well as minor and major Geo repairs. Geo brand vehicles provide their owners with economic and reliable transportation. Whether you drive a Geo Tracker, or the lively Geo Prizm, or Geo Storm, you have likely received a decade or two of loyal service. As you Geo is starting to age, it is even more important to perform regular maintenance, and especially regular oil changes. During an oil change, we not only change oil and oil filter – which extends engine life, but also inspect belts and hoses which may be getting brittle with age. We also look at other systems in your car – as a result may be able to catch developing problems and fix them before they cause a major breakdown or expensive repairs. Despite its well-deserved reputation for economy and quality, even a Geo may have an occasional “off” year. 1994 Geo Prizm did have some issues with alternators, and the 1995 Geo Metro had some engine problems, but in general, as a Geo owner, you are likely to own a vehicle that just keeps on serving you with few repairs, assuming that you provide it with regular maintenance. Our ASE nationally certified technicians have both the skills and state of the art equipment to diagnose and repair the issues your Geo may be facing. Break pad replacement, AC recharge, electrical system issues, CV boot, CV joint replacement, shocks and struts – we can get it all fixed and get your car back on the road – usually the same day. 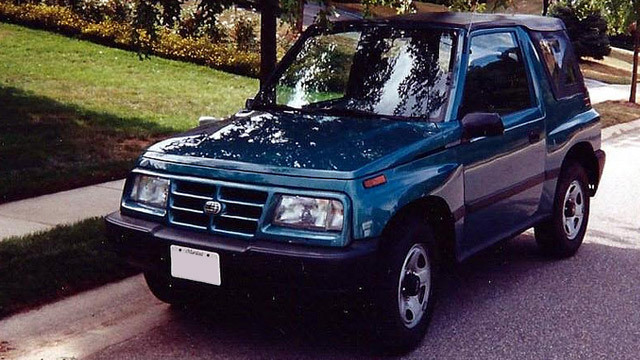 We work with following models: Geo Storm, Geo Prizm, Geo Metro, Geo Spectrum and Geo Tracker. Call us to make an appointment, or schedule an appointment online.